After James May’s Plasticine Garden at Chelsea, I was tempted to make my own plasticine flowers. If you fancy having a go yourself there’s a step by step guide below to make a rose suitable for kids or big kids. You will need a few colours of plasticine including green for leaves and some heavy gauge florist wires. (If you don’t want to let children use wires a pencil will do) The plasticine will need rolling a little to make it pliable. Start by rolling the colour for your petals into a thin sausage shape. Cut several small pieces of the plasticine and press flat into oval shapes. These are the small petals for the centre of your rose. Take your smallest petal and loosely roll it up to make the centre of your rose. 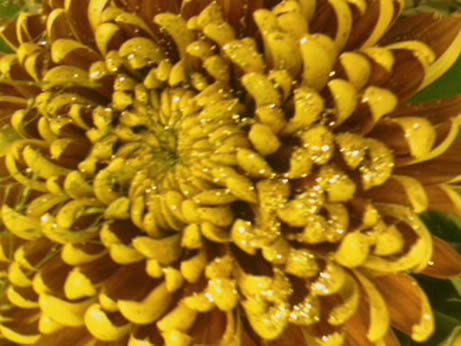 The next petal is placed around the open edge of the centre petal. Continue adding more petals always placing them over the open edge of previous petals. When you have used all your small petals, roll another long piece of plasticine. Make this piece slightly thicker than the first and cut into pieces, which should make bigger petals. Press them into flat ovals again and add to the rose. Each layer of petals should be slightly looser to make a nice open rose. When you are happy with the number of petals on the flower, you can make the flower stem. Take your green plasticine and roll it until pliable. Gather together about five wires and mould the green plasticine around them leaving a little wire showing at the end to place your flower head on. To make leaves follow the directions for making petals and then pinch at one end to make the tip of the leaf. If the leaves are too heavy you can push a short wire through up centre to support them. Place the leaves along the stem and push the flower head on the top of the stem. 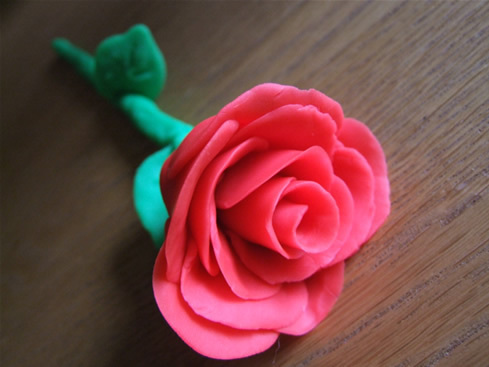 You should be able to make several flowers from one pack of plasticine. Last week Shilpa Shetty married millionaire Raj Kundra. Her father almost didn’t make the wedding as he was ill with malaria only a few days before the wedding. Shilpa’s Sangeet and Mehndi ceremony took place at the Bawa Villa on 21st November. Mehndi decorations are intricate designs of henna applied to the hands and feet. The Sangeet is one of the fun filled rituals of Indian weddings, full of song and dance, followed by a lavish meal. Shilpa’s family performed a comical musical choreographed by her friend Ganesh Hegde. 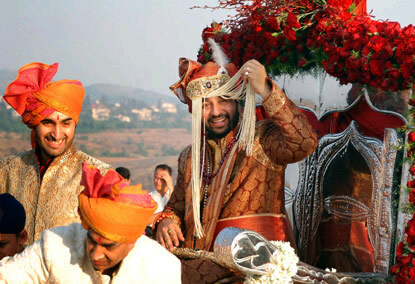 The wedding ceremony took in Khandala on 22nd November. The groom arrived at the ceremony on a horse drawn chariot. 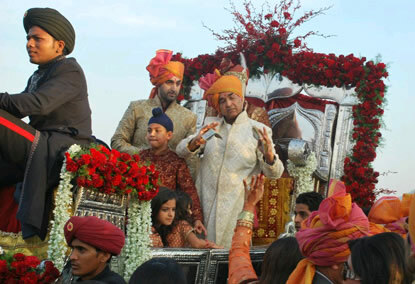 The silver chariot was adorned with lavish garlands of red flowers including orchids, roses and carnations. Raj wore a traditional sherwani in maroon with gold embroidery. The stunning bride wore a red sari embellished with gold embroidery and hundreds of red Swarovski crystals. The bride and groom both wore garlands of fresh flowers in red and white. The garlands are much longer than Hawaiian style garlands. The red and white flowers symbolise fertility and purity. The ceremony is normally conducted under a mandap, a canopy with four pillars. The couple walk around a sacred fire (Agni) seven times making vows of love, duty, respect and fidelity to each other. The reception was held on 24th November at the Grand Hyatt Hotel in Mumbai. The hotel was decorated with flowers and butterflies. Shilpa wore a fabulous gold lehenga-style evening gown and Raj wore a black sherwani. The centerpiece was the amazing 9 tier wedding cake. It weighed over 80kgs and contained chocolate, candied fruit and nuts. The guests enjoyed a selection of Indian, Italian, Thai and Chinese dishes. Their name comes from the Greek word krus anthemon which means gold flower. They are now available in many colours and thousands of varieties. Often called chrysanths, the spray type have lots flowers on each stem. 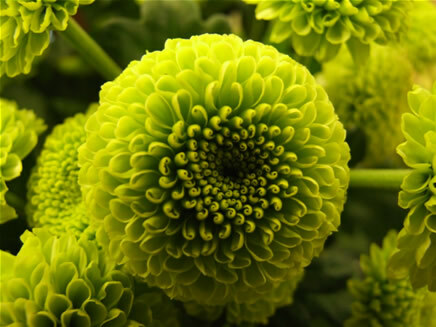 There are many types of chrysanthemum such as stallion, spider, button and spoon. Chrysanthemum blooms are specially grown, removing any side shoots to concentrate all the plants energy on producing one large central flower. Chrysanthemums are the national flower of Japan and a symbol of royalty to the Chinese. The Chinese consider them the flower of autumn, although they are available all year round. Superb English grown Chrysanthemums are available in autumn. Chrysanthemums have been very popular for years in the UK due to their amazing longevity and reasonable cost. Although they were seen to be out of fashion in recent years. They have made a big come back with the introduction of many new varieties and colours. Some of our particular favourites are Tom Pearce, which is a rich two tone bronze and gold bloom with petals that curve upwards, Chrironne Pluis a fabulous vivid green button Chrysanthemum that’s often mistaken for a different type of flower due to its unusual appearance and Artist Pink Improved, a white spray Chrysanthemum with a purple/cerise fleck through each petal. We use Chrysanthemums in many types of floristry such as gift bouquets, funeral flowers and event work. They are very hardy and last well in warm conditions. 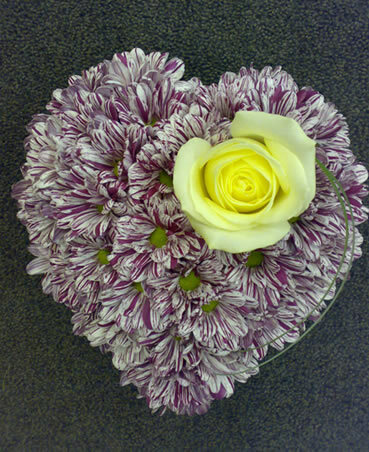 Chrysanthemums work particularly well in massed funeral work such as the heart shown below. The uniform shape of the flower heads helps creates a solid effect when placed closely together. We usually have lots to take into the reception, so we park as near to the wedding suite as possible, or use the trade mans entrance to get everything inside to set up. Typically we have a top table arrangement, table mirrors, table centres, cake flowers and vases as well as toolboxes and fabric. The reception often requires the most work to set up all the designs and time is always precious by this point in the day. We always have our fingers crossed that the table linen has been laid so we can start positioning arrangements straight away. Sometimes there are a hundred single flowers for favours to be tied on napkins with ribbon, sometimes floral chairs backs or garlands at the entrance. Not forgetting arrangements that don’t travel well, such as candelabras or tall vases that are top heavy. 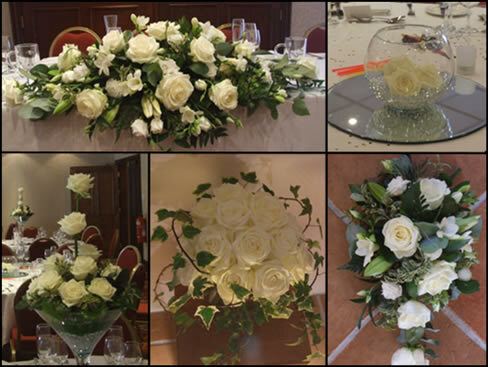 So we finish off some designs at the reception, whether it is filling lily vases with coloured water and placing the flowers in them or putting roses in greened up candelabras. When we are all done we do a final check of the room and if there is time take a few photos. The flowers always look much better in the church or reception than our untidy leave strewn work room. If any vases or props are hired we speak to the wedding coordinator about where they will be put for us to collect the next day. It’s lovely seeing a wedding reception finished with crisp linen, perfectly laid tables and all the personal touches like themed table names and special details on the table plan. We are then homeward bound for a very late lunch, happy in the knowledge the reception room looked beautiful. The bridal bouquet and bride’s maid’s flowers are usually quite time consuming to make, these are the types of designs that require all of florists experience and talent. Every bridal bouquet is different and some take several hours to prepare and construct. Wired teardrop bouquets for example consist of many small pieces including flowers, leaves, decorative wire or beads. Every single flower and piece of foliage is painstakingly wired with different gauges of wire depending on the size and weight of the flower and then taped to seal in moisture. The buttonholes are also time consuming as they are also wired and taped. The afternoon before a wedding often turns into a very late day putting the finishing touches to designs and preparing toolboxes and props to take with us for assembling any designs that have to be put together on site at the church or wedding reception. On the morning of the wedding it’s all hustle and bustle. We check the itinerary for delivery times so we know where we have to be at specific points of the day. The ribbon on the bride’s bouquet and bride’s maids bouquets are finished off once they have been taken out of water, and carefully packaged for transporting to the bride. After a final check over all the other designs we are ready to pack up the van for delivering the flowers. Packing the van can be a challenge itself, to get everything in safely and positioned so it won’t fall over or crush any other designs en route. The bridal flowers are normally delivered to the bride one to two hours before the wedding. I like to deliver the bride’s bouquet personally to ensure the bride is delighted with the flowers and advise her how to hold her bouquet. After delivering the bridal flowers the next stop is the church or ceremony room. Usually the men’s buttonholes are delivered to the ceremony. 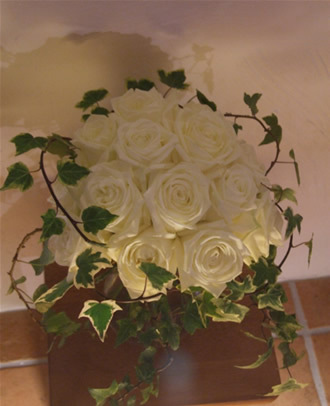 We attach pew ends arrangements and position other arrangements like pedestal flowers or garlands. We have to set up the ceremony flowers and leave before the guests arrive. If the groom and ushers arrive early they usually need a little help attaching their buttonholes. Next stop is the reception venue.